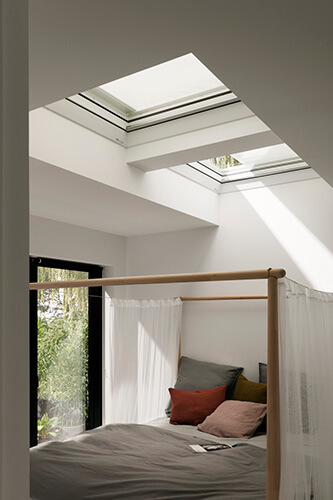 For over 75 years, VELUX have been working to create practical and stylish products that work in any and every room of the house. With versatile ideas and a high-quality promise, they supply blinds that make everyday life that little bit easier. With a stunning array of designs, it never has to be a challenge finding the perfect blinds for your home. 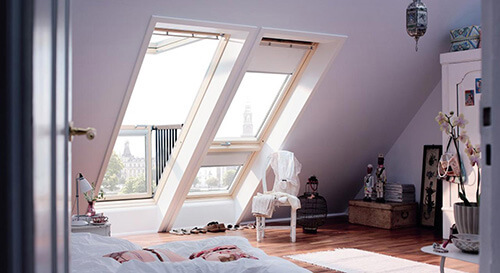 With this VELUX Blind Guide, you are sure to draw inspiration. Blackout blinds are a hugely stylish way to give you ultimate privacy and block out unwanted light from the outside. Supplied in a huge range of eye-catching colours and ranges, you can pick the perfect blind to compliment the aesthetic of any room. The classic blackout blind by VELUX is the ideal way to get the best total darkness at any time of day. 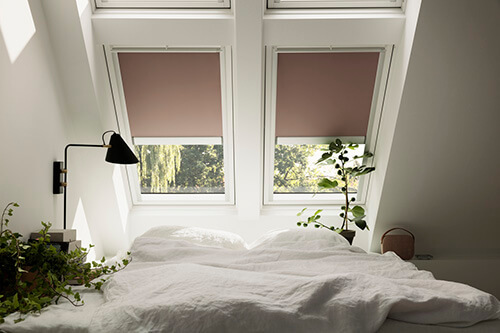 Even when the sun is rising, no light can pour past the incredible blackout technology, making this blind ideal for bedrooms, home cinemas and children’s rooms. It has a smart aluminium reflecting coating that reflects harsh sunlight in the summer and retains heat in the winter, considerably reducing heating bills and saving you money in the long run. Every blind design has been thoroughly tested, so you can have peace of mind that what you are told is 100% accurate and with 24 gorgeous colour shades you can breathe new life into any space instantly. Another excellent advantage is the quick & simple installation. 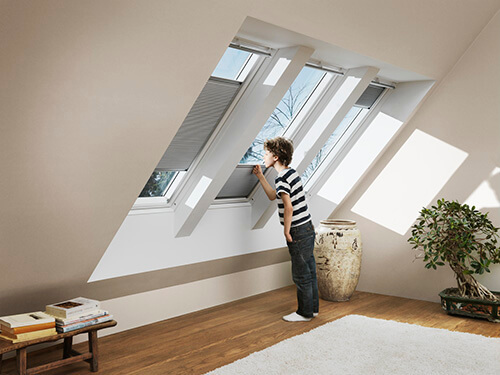 With the slick VELUX Pick&Click system your blind can be ready to use in next to no time at all. Every blind has slim aluminium channels that integrate with your window, so it really is as simple as pick & click! 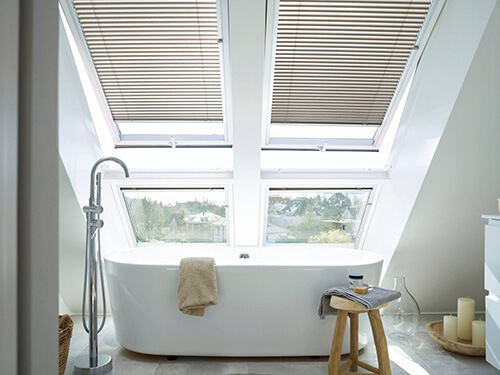 The VELUX Duo Blind combines the practicality from the blackout range and the pleated blinds into one exciting product. You can block out all unwanted light with the blackout feature and then use the semi-opaque pleated blind to diffuse the rest of the light evenly. Available in 24 gorgeous colours, this manually operated blind range is a perfect fit if you are looking for a contemporary design with high-quality reliability. You can make a big statement with the Energy Pleated blind providing a huge list of practicalities and a luxurious visual design. With an insulation effect of up to 25%, this blind not only provides privacy and light control, but is energy efficient too. The VELUX Energy blinds are crafted from double-pleated polyester blackout cloth featuring a versatile aluminium honeycomb structure. They also have elegantly bevelled corners and the polyester cords are concealed in a double layer of fabric. This blind also has fast installation due to the Pick&Click System technology. Available in 9 classic colours, the VELUX venetian blind has a unique and modern design that eliminates the need for hanging chords. It has great moisture resistance and is very easy to clean so is perfect for environments such as the kitchen and bathroom. You can simply the slats into any direction to adjust the angles, therefore giving you full control over the amount and intensity level of light coming into your room. With a high blackout ability also when closed, you can have full privacy even if the window is open. Baring a stunning decorative design, this blind is perfect for an office or living room space. With soft lighting effects and flexible positioning, you can have great control over the amount of light you want in your room as well as the addition of great privacy. This blind is available in a range of different colours and fabrics that can be easily dismounted for cleaning. There are no dangerous visible chords which make this blind very family friendly so it is ideal for the home environment. The VELUX Electric Roller blind comes in a dazzling set of 15 colours and patterns and again, offers incredibility practicality. In addition to the incredible blackout technology, this blind is electric powered for even better convenience. However, you must ensure with this range that this blind is used on. Why not add a burst of colour into your home with the Bright Yellow Electric Roller? Or alternatively if a more artistic approach is what you are searching for, how about the striking Constructivist Pattern Electric Roller Blind. If you do not have the electric windows required for the electric roller range, then the VELUX Solar Blackout Blind would be ideal for you. These blinds have impressive energy efficiency with no compromise on the incredible blackout technology VELUX is known for. To create a natural, calm vibe in any room of the house, the Natural Grained Solar Blind could be ideal or for a fresh and clean look, the same range comes in cool shades of brilliant white. Another cool favourite in the electric range is the Electric Pleated range. With a high-quality, reliable performance, the pleated blind offers a stylish solution to controlling daylight levels making it perfect for use in any room, especially spaces such as the dining area, living room and bedroom. With a selection of 20 striking colours and flexible positioning, it is hard to fault this range. It is also available with top and side channels so you can create colourful and interesting light effects which can perfectly compliment furniture and room décor. This versatile blind range comes in shades such as Snowy White, Classic Red, Metallic Blue, Sunny Yellow and many more so you can now let personality shine through with your choice of blind. Another amazing product crafted at VELUX is the Electric Light Dimming Blind. With an incredible light reduction feature and honeycomb pleated material, this range supplies great reliability and functionality at the touch of a button. It is available in two sizes and a fresh white colour. With noise reduction technology coupled with impressive insulation features, the VELUX Roller Shutter is perfect for any environment all year round. It keeps your home warm in the winter and reflects the heat and sunlight in the warmer months, meaning your room can stay at a comfortable temperature consistently. These blinds are perfect for the family home due to their excellent durability so can be used everyday with complete peace of mind. With choice of manual, solar powered or electric operation, the roller shutters can easily be paired with any of our other interior blinds. If you have been searching for a stylish way to keep your room cool all year round, the VELUX Awning Blind could be an ideal fit for your home. With heat protection and transparent fabric, you are still able to enjoy the view outside your window whilst blocking harsh run rays reducing heat impact by up to 72%. These blinds are suitable for any room in the house, but many have found they are especially in efficient in bedrooms, offices and children’s rooms. With the Solar Powered Flat Roof Awning Blind, you can operate your blind from anywhere in the room with the easy-to-use remote control. The design is not only stylish but very practical, with effective heat protection and daylight control meaning unwanted harsh sunlight no longer has to be an issue. Installed between the window and the dome, set-up is quick and simple so you can enjoy your new blind with low stress. The Solar Powered Double Pleated Blind is another high-quality flat roof option. Operated with the smart touch-screen VELUX INTEGRA® control pad you have complete an easy control and with intelligent pre-set features you can program the blinds to raise and lower at specific hours. The pleated blinds are made from translucent polyester cloth and the side channels are crafted from anodised aluminium which prevents unwanted light leakage into the room. Made from reliable, transparent fabric, the VELUX Insect Screen lets you enjoy fresh air on a warm summer day without worry of unwanted insect visitors. With easy installation and operation, the screens have a smart and sleek design that means when not in use, can be neatly stowed away in the slim aluminium top casing. Perfect for children’s rooms, these fun and eye-catching blind designs from Disney are not only great visually but have excellent practical features too. Inspired by much-loved Disney characters from Cars, Winnie the Pooh and Frozen, they can set the tone for hours of imaginative play in the day and then aid a brilliant night’s sleep with the smart blackout technology. There are also no harmful chemicals used in the making of these blinds so are very family friendly. With four intriguing Star Wars designs, this range of child-friendly blinds can entice exciting galactic adventures both in the day and night, perfect for those who have always dreamed of being a Jedi Knight. 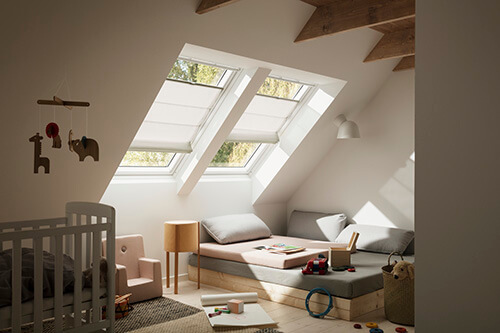 With VELUX’s intelligent blackout technology, a good night’s sleep is promised after a long day of play and manufactured from family-friendly materials, you can have complete peace of mind that VELUX puts safety first. Where can I find Velux Blinds? 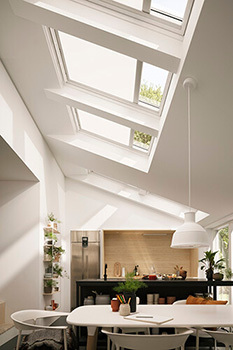 VELUX have a perfect blind made for everyone, it is just a matter of finding which is the best for you. Our website holds a stunning array of VELUX designs, sizes and colours so using our helpful guide all you have to do is pick the one best suited to you.